Now every industrial facility that produces wastewater will require zero liquid discharge (ZLD). Zero Liquid Discharge (ZLD) is a treatment process for industrial or domestic Waste water(Effluent) to reuse and to reduce consumption of natural resources being beneficial to environment and human being. ZLD systems employ the most advanced wastewater treatment technologies to treat and recycle virtually all of the wastewater produced by industries. ZLD technologies help industries to meet discharge and water reuse requirements, enabling businesses to Meet stringent state and center pollution board discharge regulations. This Technology not only help industries to reuse waste water even Treat and recover valuable products from waste streams, such as, caustic soda, sodium sulfate, potassium Sulfate, gypsum. Zero Liquid Discharge technology also play a vital role to reduce production cost to automobile industries by recovering valuable product from its effluent, Nickel Crome Etc. Water as we all know is a crucial element for life and it cannot be wasted. Industrial wastewater treatment covers the mechanisms and processes used to treat wastewater that is produced as a by-product of industrial or commercial activities and produces a liquid effluent suitable for circulation into the process areas. Water is basic necessity of life used for many purposes, one of which is Industrial use. Industries generally pay heavy taxes for the raw water. But water once get used gets contaminated so it should be well treated so it can satisfy the proper prerequisites of usage in the plant. Thus an effluent treatment plant is always laid down in any industrial plant. Wastewater generated from agricultural and food operations is biodegradable and non-toxic, but has high concentrations of biochemical oxygen demand (BOD) and suspended solids. Vegetable washing generates waters with high loads of particulate matter and some dissolved organic matter. Effluent from the pulp and paper industry is generally high in suspended solids and BOD. Plants that bleach wood pulp for paper making may generate chloroform, dioxins, furans, phenols and chemical oxygen demand (COD). Increased BOD or COD loadings, as well as organic pollutants, may require biological treatment such as activated sludge or up flow anaerobic sludge blanket reactors. For mills with high inorganic loadings like salt, tertiary treatments may be required, either general membrane treatments like ultrafiltration or reverse osmosis. Waste waters can be contaminated by feedstock materials, by-products, product material in soluble or particulate form. Treatment facilities that do not need control of their effluent typically opt for a type of aerobic treatment, i.e. aerated lagoons. The production of iron from its ores involves powerful reduction reactions in blast furnaces. Cooling waters are inevitably contaminated with products especially ammonia and cyanide. Contamination of waste streams includes gasification products such as benzene, naphthalene, anthracene, cyanide, ammonia, phenols, cresols together with a range of polycyclic aromatic hydrocarbons. Power plants are a major source of industrial wastewater. Many of these plants discharge wastewater with significant levels of metals such as lead, mercury, cadmium and chromium as well as arsenic, selenium and nitrogen compounds. The launder leads the dirty water from scrubber to the distribution chamber. Inlet channel is designed for a particular flow and velocity to avoid the distribution chamber. The distribution chamber is designed to lead the water evenly to the flash mixers, downstream through channels by gravity. For equal distribution of flow to flash mixers isolation gates are also recommended. This unit is provided for chemical reaction with effluent. Here effluent is treated with Alum as coagulant, Lime as pH regulator and Polyelectrolytes as Flocculent. Main purpose of sludge tanks are to hold the underflow sludge and transfer it to filter press for dewatering.Each tank will be provided with mechanical agitator which will constantly agitate the sludge in order to prevent sludge settlement in the tank. For dewatering purpose, filter press is most efficient and economical among all other filters. Other filtration systems offer high pressure filtration but only the filter press has both high pressure capability and efficient filter cake removal. Sewage treatment is the process of removing contaminants from wastewater, primarily from household sewage. The separation and draining of household waste into greywater and blackwater is becoming more common in the developed world. Greywater is water generated from domestic activities such as laundry, dishwashing, and bathing, and can be reused more readily. Blackwater contains human waste. Sewage is a major carrier of disease (from human wastes) and toxins (from industrial wastes). The safe treatment of sewage is thus crucial to the health of any community. 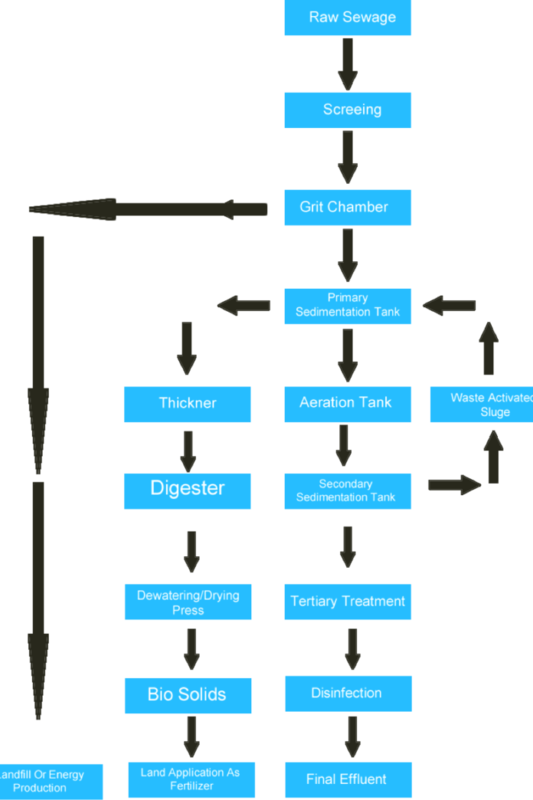 The basic principle of the working of a biological treatment plant is decomposition of the raw sewage. This process is done by aerating the sewage chamber with fresh air. The aerobic bacteria survive on this fresh air and decompose the raw sewage which can be disposed off in the sea. Screening is the first stage of the wastewater treatment process. Screening removes large objects like, trash, tree limbs, leaves, branches, and other large objectsthat may block or damage equipment. The ‘almost’ treated wastewater is passed through a settlement tank. Here, more sludge is formed at the bottom of the tank from the settling of the bacterial action. Again, the sludge is scraped and collected for treatment. The water at this stage is almost free from harmful substances and chemicals. The water is allowed to flow over a wall where it is filtered through a bed of sand to remove any additional particles. 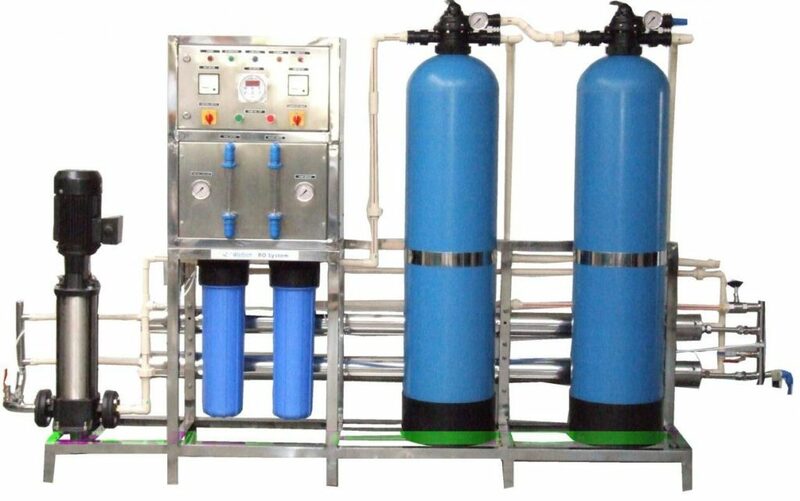 Reverse Osmosis (RO) is a membrane based process technology to purify water by separating the dissolved solids from feed stream resulting in permeate and reject stream for a wide range of applications in domestic as well as industrial applications. It is seen that RO technology is used to remove dissolved solids, colour, organic contaminants, and nitrate from feed stream. Reverse osmosis is the process of forcing solvent from a region of high solute concentration through a semi permeable membrane to a region of low solute concentration by applying a pressure which is excess of osmotic pressure. A good R.O. system with controlled TDS can remove contaminants such as arsenic, nitrates, sodium, copper and lead, some organic chemicals, and the municipal additive fluoride which are harmful for the human body. RO water is used to prevent scale formation. A latest concept in the water treatment technology, a Multi Grade filter consist of vertical or horizontal pressure sand filters that contain multiple layers of coarse and fine sand (pebbles and gravels)in a fixed proportion. It is a kind of deep filter bed with adequate pore dimensions for retaining both large and small suspended solids and undissolved impurities like dust particles. With high throughputs, high dirt holding capacity and capacity to reduce turbidity and TSS (<5 ppm) from water, it protects ion-exchange resins and membranes from physical fouling due to suspended impurities present in water. Activated carbon filtration (ACF) is effective in reducing certain organic chemicals and chlorine in water. It can also reduce the quantity of lead in water although most lead-reducing systems use another filter medium in addition to carbon. Water is passed through granular or block carbon material to reduce toxic compounds as well as harmless taste and odor producing chemicals. Cartridge filters are the machines which is used in filtration purpose by uses the filtration technology of removing solid matter and suspended impurities from a fluid stream by passing it through a variety micro porous filters, ultrafiltration units, green sand cartridge filters, activated carbon cartridge filters, diatomaceous earth and multimedia cartridge filters. Pump is characterized by its ability to deliver a high constant pressure and a considerable flow. When dealing with water purification, corrosion-resistance is a key word. 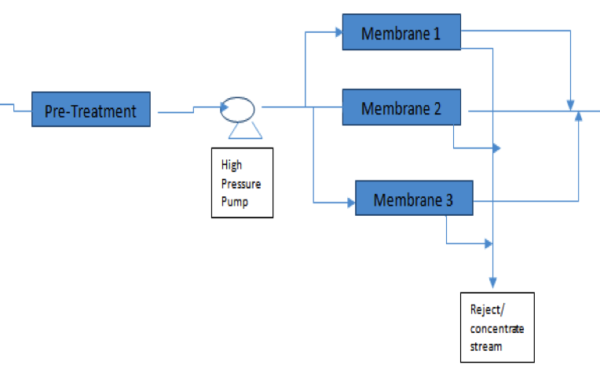 In connection with membrane techniques, where pressurized raw water flows through a membrane, pumps with special characteristics are needed. The heart of any RO system is Membrane. The membranes used for reverse osmosis have a dense layer in the polymer matrix – either the skin of an asymmetric membrane or an interfacial polymerized layer within a thin film composite membrane – where the separation occurs.